(VEN) - Top officials met recently in Hanoi to discuss implementation of a Politburo resolution designed to turn Vietnam into a leading industrial nation. Resolution 23-NQ/TW issued in March 2018 pertains to the formulation of a national policy for industrial development until 2030, with a vision towards 2045. The resolution’s general objective for 2030 is for Vietnam to accomplish its industrialization and modernization goals and stand among the top three ASEAN countries in terms of industrial development, with some industries achieving global competitiveness and deep involvement in global value chains. The vision for 2045 is to turn Vietnam into a modern industrial nation. 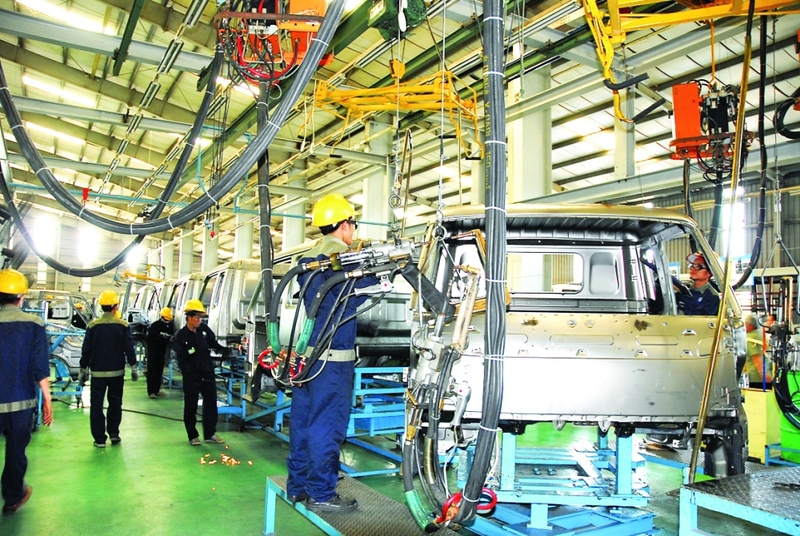 Under the resolution, the industrial sector is expected to create more than 40 percent of Vietnam’s gross domestic product (GDP) by 2030, about 30 percent of which is expected to be created by processing and manufacturing industries. High-tech products are set to account for at least 45 percent of the production value of processing and manufacturing industries, and the industrial sector’s added value is expected to grow more than 8.5 percent annually. The added value of the processing and manufacturing industries is set to grow 7.5 percent per year. Deputy Minister of Industry and Trade Do Thang Hai affirmed the MoIT’s determination to achieve these industrial development targets and the policies outlined by the resolution. These include space distribution and industrial restructuring, policies to promote the development of prioritized industries, policies to create a favorable investment and business environment for industrial development, policies to develop industrial businesses, human resources, and science and technology for industrial development. “This resolution is very important to the MoIT. All member units of the ministry have joined efforts to formulate the national policy for industrial development,” the deputy minister said. Duong Duy Hung, Director of the MoIT’s Planning Department, said existing policies must be reviewed and assessed before adopting a national policy for industrial development in accordance with the spirit of the resolution. Sharing this opinion, Nguyen Van Thanh, Director of the MoIT’s Vietnam Chemicals Agency, said the national policy should focus on prioritized industries, such as engineering, coal, electricity and chemicals. “Prioritized industries should be identified in a flexible manner. The policy’s effects on each industry should be assessed periodically to make necessary adjustments,” he said. Deputy Minister Do Thang Hai has provided guidance for the MoIT’s member units to formulate policies to encourage investment in industrial development in accordance with the resolution. Deputy Minister of Industry and Trade Do Thang Hai has assigned the Industrial Department to coordinate with other departments and agencies of the MoIT to formulate a national policy for industrial development until 2030, with a vision towards 2045.